A tiny word can say it all. 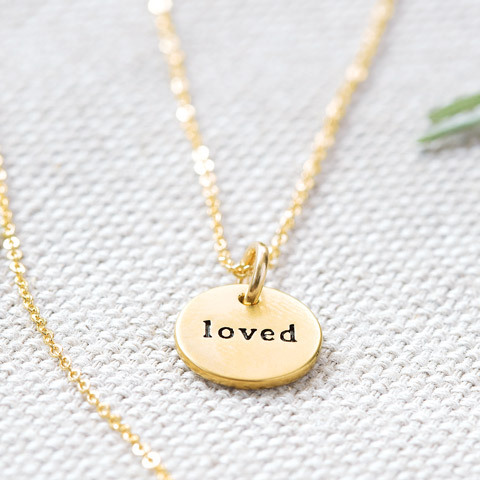 Hand engraved with the word “loved,” a petite gold plated charm measuring approximately ½" in diameter hangs from a delicate gold filled chain with spring ring closure. 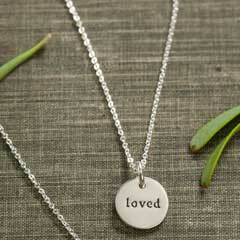 Necklace measures 18" in length and comes gift wrapped in a hand crafted wood crate with ribbon. 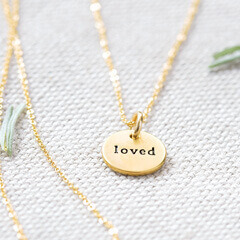 "Loved" Circle Necklace is rated 4.4 out of 5 by 49. 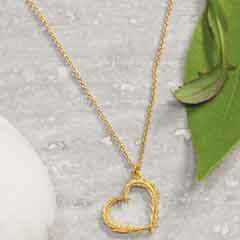 Rated 5 out of 5 by Jess P from Beautiful Necklace, Great Customer Service I bought this necklace as a gift and the recipient loved it. It's a beautiful piece of jewelry. And the representative at Olive & Cocoa who assisted me was wonderful and very efficient. 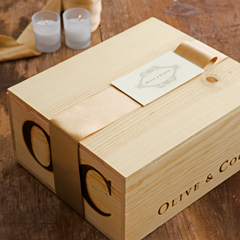 Will definitely be using this company for corporate and personal gifts again. Rated 2 out of 5 by marybeth from A Little Small I bought this for a loved one, but it was ridiculously small and cheap. It looked good on my 9 year old daughter, but not a grown woman. 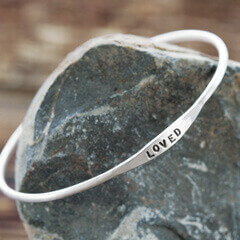 Rated 5 out of 5 by Phily from I loved it This is a beautiful necklace. I will always treasure it. It is nice and light. I hardly know I am wearing it. Rated 5 out of 5 by NanaSky from Beautiful! My daughter and granddaughter received their early Christmas gift from Santa through the mail and were thrilled! They “loved” the necklaces! 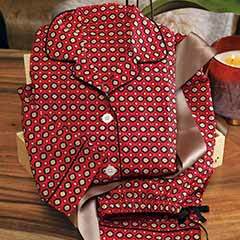 Rated 5 out of 5 by Clankard from Small but mighty Small but mighty and the perfect gift for a granddaughter or a Special friend. Rated 5 out of 5 by SunnyinNC from Perfect gift A group of long time friends bought this for another friend who was turning 60 and has some challenging health issues. It was perfect. Well presented and delicately lovely. Rated 5 out of 5 by ninetta from Lovely, but warning This is a first class necklace. My only concern is the chain which is extremely delicate came knotted. A friend of mine who makes jewelry unknotted it. She recommends that you store it full length taped to the cloth it comes with so it cannot reknot itself. I love it. Rated 4 out of 5 by Gatecreek from A lovely gift but smaller than we expected I’m not certain if the dimension was given in the catalog but my first impression was that it was smaller than I expected. Just the same, our daughter was very happy with it.